Espionaut, a game set in World War II that allows the player to become a spy that has infiltrated the ranks of the Nazis. Our game takes place before the infamous D-Day invasion. In real life the WWII spies that had successfully become Nazi soldiers were given three objectives to accomplish before D-Day. To change the believed date and location of the invasion, and also, to spread rumors of larger assault that would take place after the first. Our game is an RPG that allows the player to attempt to accomplish the same goals. The player’s success with these objectives determines the outcome of the invasion in the game. Would you be able to successfully trick the Nazis? Alex Wright is a First-Year at Centre college from Knoxville, TN. He enjoys all times of games, but some of this favorites are Binding of Isaac, Borderlands 2, Skyrim, and the Fallout series. With this project, Alex focused on learning how to use RPG Maker. He did some map design, but mostly put in all of the dialogue and events in the game. Clay Hundley is a First Year Student from Louisville, KY. He enjoys playing Rocket League, Fortnite, Tom Clancy’s Rainbow Six Siege. Clay focused on the referencing part of the game. Rather it be books, movies, or videogames, he found them. He wishes he could’ve found more references for the team. Jordan Cordoba is a First Year at Centre college. He is from Murfreesboro,Ten. He plays football at Centre as well. He enjoys playing video games and hanging out with friends. Jordan’s part in making the game included some mapping for the game and historical research. Yue Feng is a First-Year student at Centre College. She is from mainland China. Her favorite games are all from Blizzard, including World of Warcraft, Heroes of the storm, Hearthstone. Yue mainly does the research jobs in the group, collects the historical contexts from the books. Rachel Morgan is a First-Year student from Pikeville, KY. Every game she plays is her favorite game for about a week, but the ones that have endured are the Mafia series games, Skyrim, and the Fallout series. For this project, Rachel worked on crafting narrative and dialogue for the game. Belchem, David. Victory in Normandy. London: Chatto & Windus, 1981. Dolski, Michael, Sam Edwards, John Buckley, and Michael Dolski. D-Day in History and Memory: The Normandy Landings in International Remembrance and Commemoration. Denton, TX: University of North Texas Press, 2014. Kross, Peter. The Encyclopedia of World War II Spies. New York: Barricade, 2003. Masterman, John Cecil. The Double-Cross System in the War of 1939 to 1945. New Haven: Yale University Press, 1972. Mosier, John. Cross of Iron: The Rise and Fall of the German War Machine, 1918-1945. New York: Holt Paperbacks, 2007. Persico, Joseph. Roosevelt’s Secret War. New York: Random House International, 2003. Who’s Who in Nazi Germany. 4th ed. Central Intelligence Agency, 2001. Everyone on Team Centrenaut thoroughly enjoy working on this game and this project. We all worked hard to create a game that is a window into the inter-workings of World War II. Our main goal was for the player to have fun playing our game, but also to learn something. Our group worked incredibly well together and there was never an issue. Everyone committed to a single vision and helped to ensure that we accomplished it. With that said, our group’s appreciation of both History and Video Game has been greatly increased after this class. Thank you to Dr. Harney for all of the help, and to anyone else that contributed to Espionaut. The main goal of The Centrenauts, was to make video game and to do that we need software that could help us. RPG Maker was what we picked, and it has been one of the most frustrating but also rewarding learning processes. For all of the limitation of RPG Maker, there are so many cool things that can be done with the program. From the small victories such as learning how to add a new map, to the huge victories of having intricate dialogue, it’s been a step by step process. The program is extremely overwhelming at first, and honestly, it still is even after sinking hour after hour into it. The first step was to learn how to create a map and design it. I remember getting excited when I randomly right clicked on something, and the “new map” option appeared. It seems almost laughable now that I struggled with that, but I still find issues with the most trivial things. Tilesets for example are still a pain. Tilesets are the sets of blocks and design options for the maps. There are hundreds and hundreds of “tiles,” but you must assign the sets to a map when you start it, meaning that you cannot just pick and choose any tile you want to use. It took me a while to figure out that you can mix and match the sets to fit your needs, which was a major victory. With this, map design finally felt more manageable. Jordan did most of the map design and did a great job. He quickly learned how to take advantage of what the program offers and exceeded my expectation of what we could do. Now with map design down, we had to learn how to add events. Adding events to our game has proven to be the most difficult learning curve for us. Once again it took randomly right clicking something for the magical word “insert” to pop up. With this we could now get our character to teleport somewhere, have dialogue, and a ton of other things. The problem is to correctly order all the events, making sure they flow together, and to not crash the game. Recently, after a couple hours of frustrating trial and error, I learned how to get an NPC to lead our character somewhere. The problem is, I cannot get the NPC to stop! Every time our character talks to the NPC, he exclaims “Follow me! !” and then leads us right into a wall, making the game freeze. I’m positive that it is an easy fix, but like everything else in RPG Maker, you have to figure it out. This has been frustrating, but when I do finally figure out that small thing that’s been oh so annoying, its incredibly rewarding. Looking back now at everything that’s been a pain and struggle in RPG Maker, it makes me more appreciative of the game that we have made. The game is not even close to being a full game, but every time I move our character and play what we’ve created, I’m proud of it. I know what went into every aspect of its creation. Through all of the struggle, I am proud to say that we made a video game. 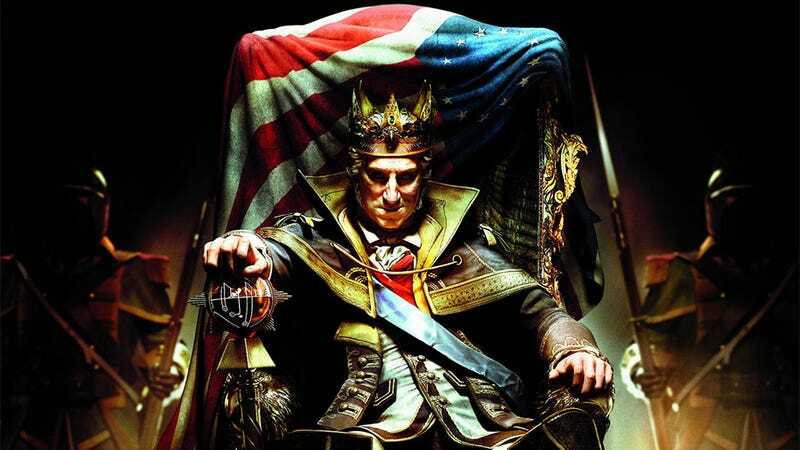 In this DLC, George Washington sets up a monarchy in “The United Kingdom of American” and declares himself the king. I remember when I first saw this DLC’s trailer back in 2012, my mind was blown. What an insane idea, I just played this game where I help the 13 Colonies overthrow the British, and now I had to fight George Washington! My 12-year-old mind exploded a little, but why? This DLC is the definition of counter-factual. In reality, a democracy was put in place, and a monarchy would have gone against everything the founders believed in. This part of history had been crammed into my mind over and over again by teachers reading out of a textbook with Washington’s face on the cover. The idea of Washington being the enemy was different and exciting, subconsciously I started running through the history I knew to be true and then asking, “what if?”. A part of history that had previously been just another section in a textbook was now revitalized. That is the power of video games. They allow one to “play” with history and to engage with it, instead of just reading facts. The question of “why?” is extremely power in history, as we have learned in this class. With this DLC in mind, why even do something like this? Granted, it is mostly for monetary value, but I think that it also has educational value. It helped little 12-year-old me to consider how a different system of government would affect America and then to visualize that difference in the game. This is undeniably valuable, even if the concept of the DLC is absurd. Today was day two for the Centrenaut’s project, and it felt like a dive into a pool of information. Time was dedicated to the search of books that relate to the area of history our group wishes to convey. That area being World War II, specifically spies in the war. The first concern of our group, was if the library would even have enough resources for our subject matter. To our surprise though, we ended up finding seven books about spies, espionage, and secret wars. Now, it was time for the dive. There was one book that I found particularly interesting, The Double Cross System In The War of 1939 to 1945, by J.C. Masterman. In this book, I was drawn to the chapter 11, Deception For France. 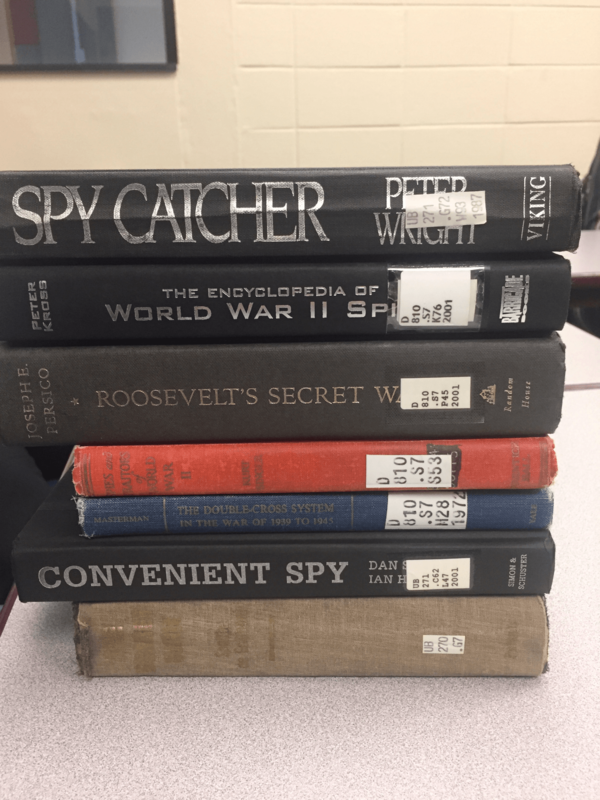 This chapter focuses on the work that spies did to cover up the plans for the Normandy invasion. At first, the spies did their jobs so well that the Germans considered attacks coming from Northwest Africa or in the Mediterranean. Eventually though, it became impossible to disguise that the assault would be somewhere in between the Cherbourg peninsula and Dunkirk. With this, the spies developed a deception policy that consisted of three points: postpone the believed date of the attack, indicate that the attack would come in the east rather than in the west, and to suggest that another assault even stronger would occur after the first. Just this morsel of information offers up so many potential ideas and concepts that can be implemented into our game. The deception policy specifically establishes goals of the spies, which is extremely valuable information. The goal of our group now, is to keep researching and pulling information from our books that will add to the historical accuracy of our game. With a typical dive into a pool, one feels shock as the cool water hits, but then it is exhilarating. The dive that my fellow group members and I took today yielded the same results. Shock, exhilarating potential, and finally excitement to dive further in.